Also known as pellet smokers, pellet grills are the ‘trendy’ product when it comes to barbequing. They’re appealing to both beginners and professionals as they’re easy to use and make a job of cooking high-quality foods a breeze. It may surprise you to learn that pellet grills aren’t all that new. In fact, they’ve been in use for over three decades. During this time, they’ve evolved to become versatile multipurpose cookers where you can roast, sear, smoke and even bake your food. Pellet grills provide an affordable and sustainable heat source for cooking your barbeques. Each pellet is a small hardwood capsule. From their very beginnings, their main feature has been their simplicity. All you have to do is load the hopper with pellets and set the controller. The grill then springs into action, suppling its own fuel and smoke. As technology has advanced, today’s pellet grills are high-spec appliances with excellent temperature control. Behind the scenes, they use sophisticated algorithms that help to maintain the temperature you set. Additionally, they use intermittent fans that blow quick puffs of air to achieve even the most precise of temperature changes. Some brands have digital controllers where you can adjust temperatures in increments of 5°F. When you use a meat probe along with the temperature sensor, you can lower the heat when your meat is cooked. According to tradition, smokers have always cooked indirectly. The modern and more advanced digital models allow higher cooking temperatures, which means that some pellet grills are flexible and multipurpose cookers. Some models allow you switch between indirect and open-flame cooking. So, for searing a juicy steak, smoking a brisket, roasting a turkey or cooking a pizza, a pellet grill is your ideal choice! 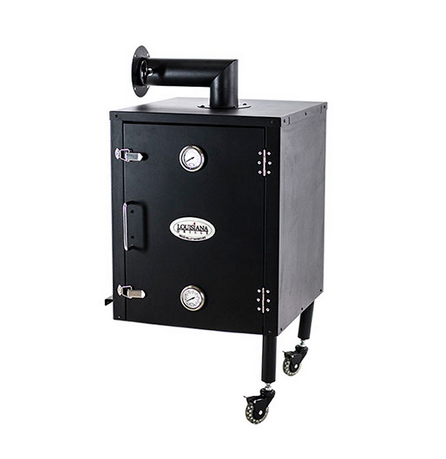 Some quality brands like Louisiana Grills offer a cold smoke box that mounts on the side of the grill. This option allows you to smoke fish without overcooking it. No other style of grills will match this feature!